Each year a select group of students from all over the world work alongside network engineers and IT professionals to build the world’s fastest temporary network—SCinet. Altogether more than 180 volunteers from educational institutions, high performance computing centers, network equipment vendors, U.S. national laboratories, research institutions, research networks and telecommunication carriers design and deliver the network for the annual SC Conference. Student volunteers work closely with a variety of SCinet teams, and they play an integral role in bringing the network to life. In return, SCinet offers these students an opportunity to grow their professional networks and participate in an immersive professional development experience unlike any other. Student volunteer Jehandad Khan helped staff the SCinet Help Desk, which serves as the first point of contact for exhibitors regarding all SCinet services during SC conference week. Following their participation in SC17, a group of student volunteers reflected on their experiences with SCinet and reasons for coming back for multiple SCs. In 2011, Julian Hammer attended SC for the first time to present his bachelor’s thesis on the topic of simulations parallelization. He has returned each year since to volunteer with SCinet. He said volunteers join SCinet from a variety of fields and with varying degrees of networking experience. Hammer is a doctoral student at the University of Erlangen-Nürnberg in Germany, and his research focuses on modelling the performance of HPC kernels. His passion for networking and HPC is the reason for his six-year stretch as a SCinet volunteer, which has provided him with experience on SCinet’s DevOps and Architecture teams. As a member of the latter, Hammer’s name was credited on the official SCinet architecture diagram at SC17. “Both teams are very supportive and try to integrate students with interesting tasks. In DevOps I was free to implement my own measurement statistics and analyses, which were displayed on the show floor. In Architecture I was able to get a glimpse at how the network pieces fall together and get planned during the months before SC,” Hammer said. 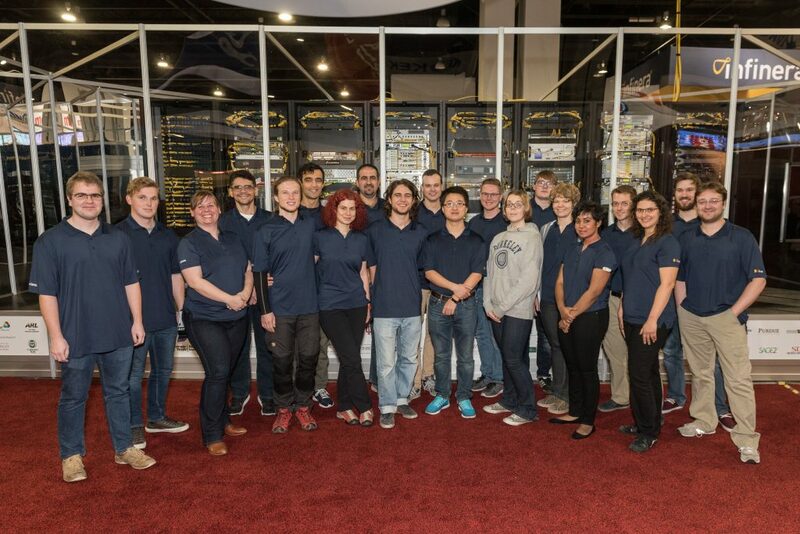 SCinet student volunteers and volunteer coordinators posed in front of the network operations center during SC17 at the Colorado Convention Center in Denver. Left to right: Martin Wenzel, Tanner Juedeman, Laura Pettit, Lucas Brasilino, Julian Hammer, Jehandad Khan, Daniela Novac, Omar Aaziz, Paul Bethge, Felix Zahn, Xinchen Guo, Brian Eschen, Kelly Rowland, Erik Kooistra, Sarah Neuwirth, Neilda Franklin, Nathan Hanford, Anja Gerbes, Felix Kaiser and Jeremy Musser. Xinchen Guo is a Ph.D. student in computer engineering at Purdue University in Indiana and a SCinet volunteer since 2014. Guo’s research focuses on performance tuning scientific software at extreme scales. While his roles on the SCinet Power, Logistics, and Help Desk teams are not closely related to his research, the people of SCinet and the diversity of the work are what continue to draw Guo back. Daniela Novac and Xinchen Guo collaborated with other SCinet student volunteers and the SCinet Fiber Team to place more than 60 miles of fiber in the Exhibit Hall for SC17. Daniela Novac volunteered at SC for the first time in 2012 when she was an undergraduate student at the University of Erlangen-Nürnberg. Novac started volunteering for SCinet two years later. Now a doctoral student studying software watermarking, a technique used to prevent software theft, she continues to dedicate two weeks each November helping to set up and operate SCinet. Her participation includes serving on the SCinet Network Security team. Felix Zahn completed his third year as a SCinet volunteer during SC17. He is currently pursuing a Ph.D. in computer engineering at the University of Heidelberg in Germany. Zahn cited his SCinet peers as the main reason for his return. A SCinet student volunteer for two years, Gonzalo Rodrigo continues to be dedicated to the effort following his graduation from Umeå University in Sweden. Rodrigo is now a postdoctoral researcher in the Data Science and Technology department at Lawrence Berkeley National Lab in California. At SC17, his name was listed alongside Julian Hammer’s on the SCinet architecture drawing. The SC Conference series offers students many opportunities to get involved. The call for student volunteers is open now through June 15, 2018. 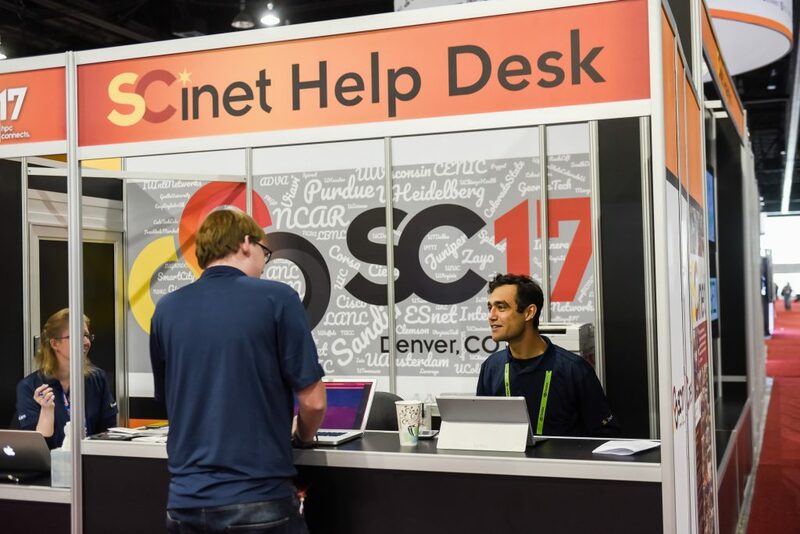 Visit the SC18 Student Volunteers page or email volunteers-leads@scinet.supercomputing.org for more information about how to get involved.